Orange’s Manny Anderson (6) hauls in a touchdown pass in front of Westerville Central’s Myles Williamson during the first half of Thursday’s OCC showdown in Lewis Center. Orange’s Graham Starn (2) fights off a Westerville Central defender during the first half of Friday’s game in Lewis Center. 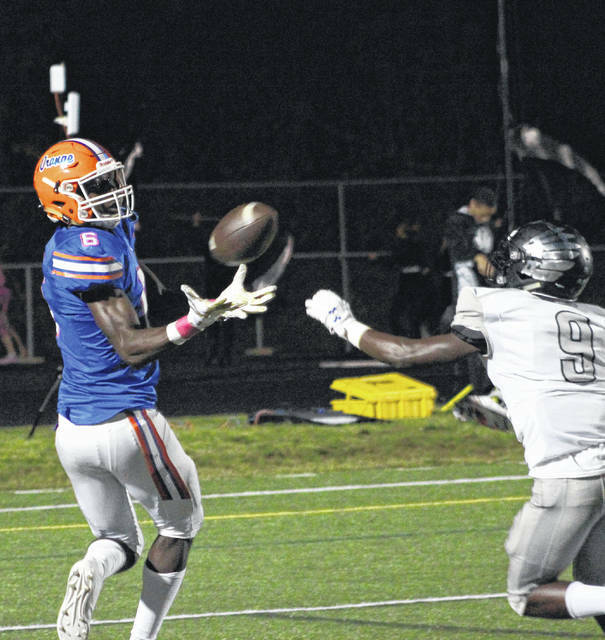 Olentangy Orange football coach Zebb Schroeder wanted to keep the ball away from visiting Westerville Central and its prolific offense. The Warhawks, who averaged close to 24 points per game coming in, had key players that went both ways. Schroeder thought he could take advantage of that. “If you look at their schedule, they’ve put up a lot of points against a lot of good defenses,” he said. The Pioneers ran 59 times out of 64 total plays on offense, racking up 366 yards on the ground en route to a 35-10 OCC-Buckeye win Thursday night in Lewis Center. 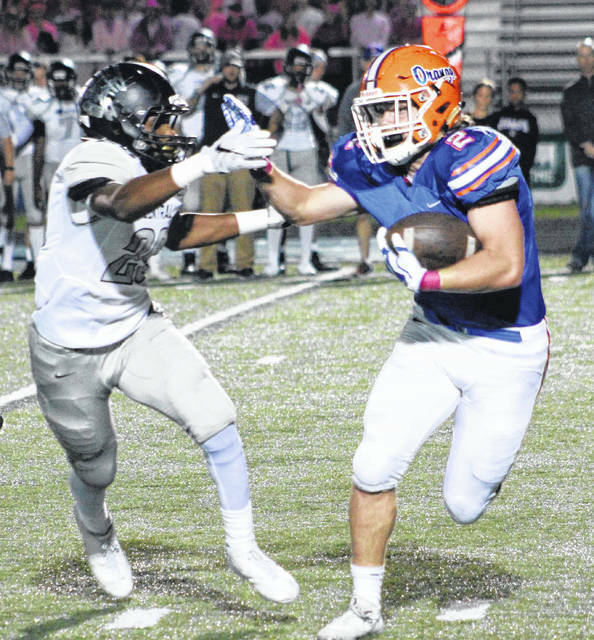 Seniors Graham Starn (216 yards on 25 carries) and Jack Applegate (106 yards on 17 carries) did much of the heavy lifting for the Orange offense. Starn scored twice and Applegate added another rushing touchdown. Quarterback Luke Schmeling completed three of his five passes, including two for touchdowns and receiver Manny Anderson caught all three balls for 62 yards and both scores. It was so run heavy that Westerville Central packed the box on a play in the fourth quarter, leaving Anderson uncovered. Schmeling audibled out of the play and lobbed a ball to Anderson for an easy 21-yard touchdown. “We had a power play called and Luke Schmeling – he’s very poised under center. He saw it and spit it out there to Manny,” Schroeder said. Zane Fisher had 7.5 tackles, Zach Harrison had 5.5 – including three for losses and 2.5 sacks. Garrett Runyon, Jimmy Sensibaugh, and Joel Sarpong each had interceptions for the Pioneer defense. Jayden Rodgers blocked a 40-yard field goal attempt late in the second half to preserve an Orange 14-7 lead at the break. Allen Smith paced the Warhawks with 122 yards on the ground on 21 carries and a touchdown and Jacob Borcilla had a 25-yard field goal. Next, Orange hosts rival Olentangy Liberty in league play next Friday at 7 p.m. The Patriots won twice last year by seven points apiece.